On sale for just $3! 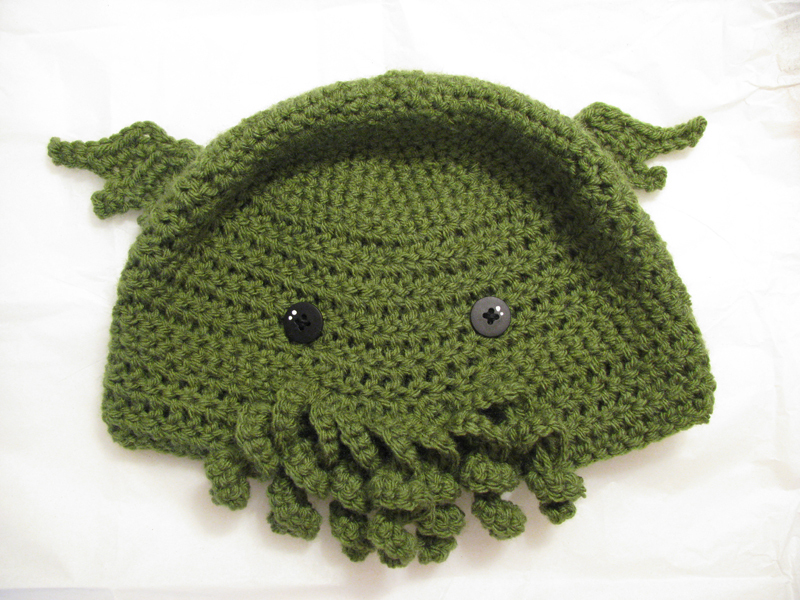 That’s right, my Cthulhu Toque pattern is FOR SALE! :D It’s available for the low price of just $3.00 now, so if you’ve been wanting to make one of your very own, now is the time. I promise it’s easy, even for a beginner, and you’ll love the super cute results. You can purchase from whichever site is easiest and most convenient for you :) You’ll love the way Cthulhu looks innocently over the top of your head as he noms on you. I cannot be held responsible for any problems resulting from your new abundance of coolness and popularity once you go strolling down the block wearing one of these on your head. Note: If you purchase from Ravelry you will be able to instantly download the PDF pattern from the site after purchase; If you purchase from the Pink Toque Shop, you will receive your PDF pattern via email within 24 hours of purchase via email. 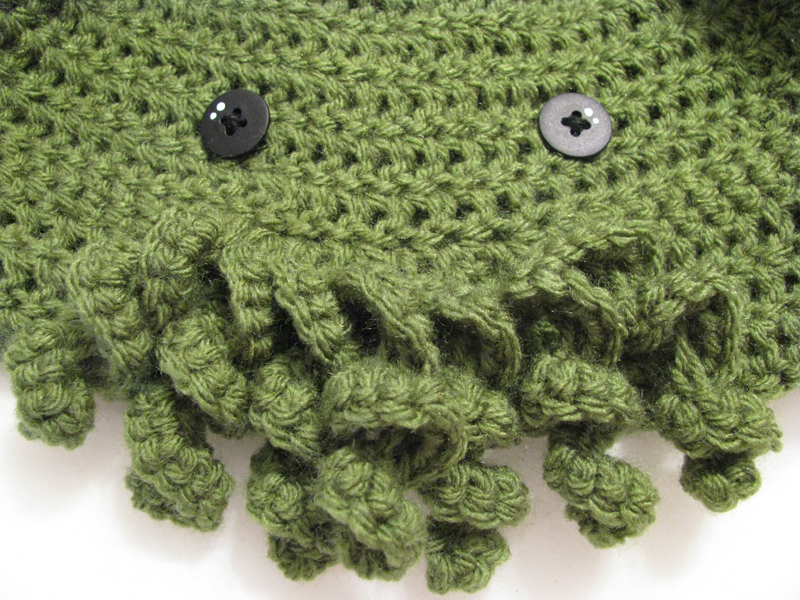 Approximately 4 single crochet stitches = 1″ in worsted weight. 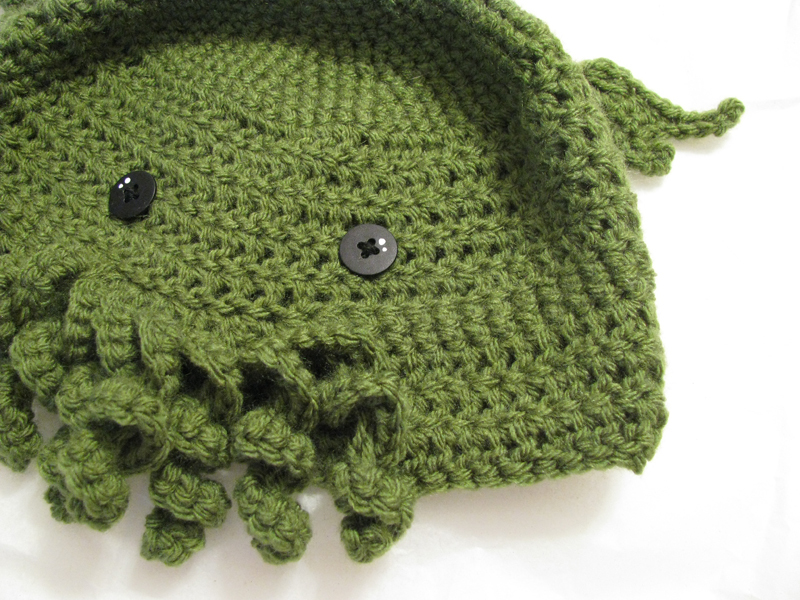 See how easy it can be to sport your very own crochet Cthulhu toque? 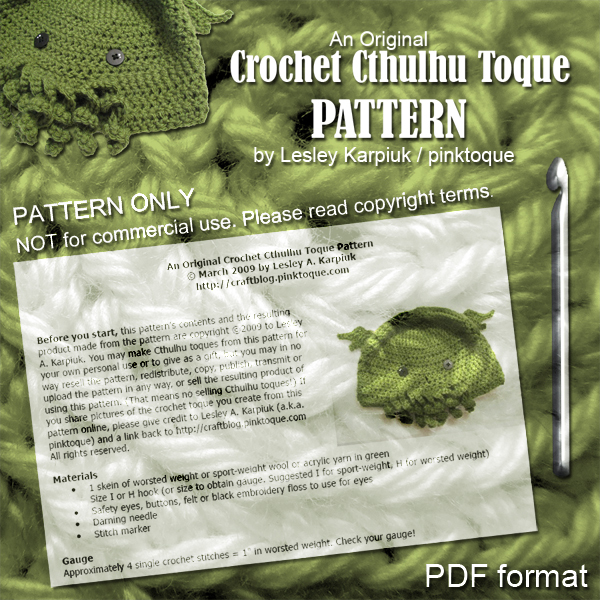 But Lesley, I don’t know how to crochet! Well that’s easy – you can also purchase a completed toque, already handmade by yours truly in case you don’t have the skills to make one for yourself.Ã‚Â It’s never been easier to get your hands on a one-of-a-kind creation that will make you the talk of the neighborhood. For serious. The morning and afternoon commute consists of my husband and IÂ sharing a seat on the Calgary CTrain, aka public transit. We’re on the train for around a half hour each way to get into downtown for work. I always carry some knitting and he usually reads the free morning paper on the way in. I enjoy using public transit; there are lots of interesting people on the train and I don’t have to deal with traffic. Unfortunately, that also means I (along with everyone else) am usually subjected to random idiocy, such as Loud-Talking-People who simply MUST have that private conversation about their recent medical exam or issue with “that horrible girl from accounting” as loudly as possible on their cell phones. They do realize that they are on public transit, right? Their conversations are aired out to the world and most of the time they don’t even realize they are forcing everyone else on the train to listen in on their private lives. It’s annoying. I don’t care that you split your pants at work, nor do I want to hear how you just can’t stand so-n-so or “Like, omg you should’ve heard what she said to me!” drama.Â Â No thanks. 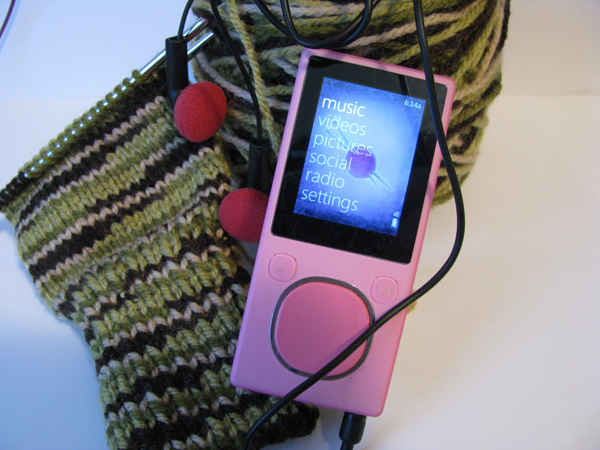 Suddenly with an MP3 player, my issues seem to be solved. I get on the train, snuggle next to Lucas as he reads his paper, and get lost in my knitting zone.Â It’s zen: my favorite music is playing — quietly enough to not disturb those around me or kill my ear drum, but also at a level where most everyone else is tuned out — and I knit. And I knit. And before you know it, I hear the signal that I’m a stop or two away from where we get off for work and I put my things away and smile happily; a happy sigh that can only be achieved by pure bliss. Sure I still have to smell some of the other passengers, but not being forced to listen to the ones that talk so loudly about things no one wants to hear while still getting to enjoy hubby and my knitting for a full half hour (twice a day!) is fantastic. I have found my knitting zen. Now I just gotta be sure to not turn into one of *those* mp3 listeners — it’s been hard to keep myself from breaking into song occasionally (music will do that to you), and I do find myself gently tapping my foot or getting my knitting into the rhythm of whatever song is playing.Â As long as I can keep it confined to my hands and my knitting instead of singing aloud, it’ll be all good. Because trust me… no one wants to hear that. 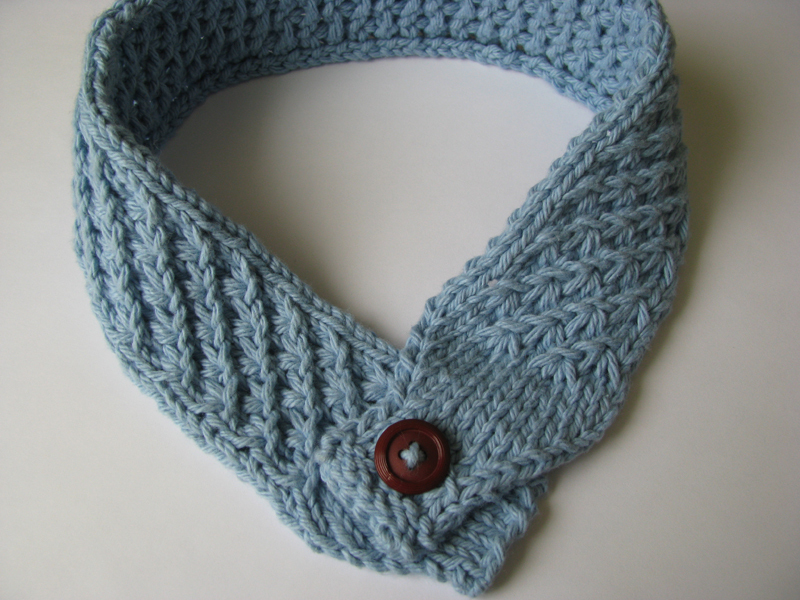 Knit every row for 10 rows or so…until the wing is the size you want. Attach to body from the slightly narrow middle with the smooth side on the outside. Now don’t you agree, the result is fantastic? 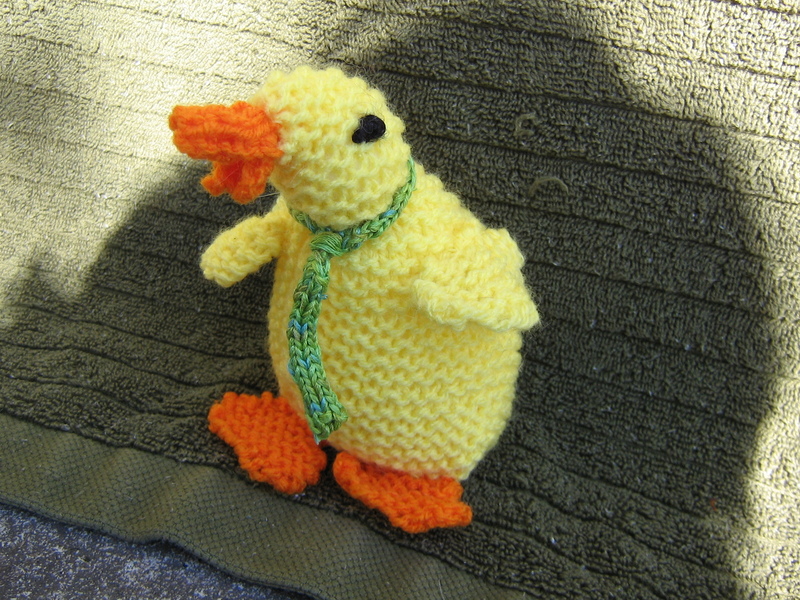 Jill’s ducky rocks my socks off, and when I first read her email and saw the little knitted tie on her ducky, I squealed aloud. SO cute. 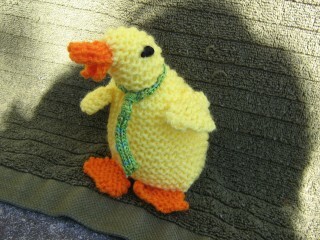 Great job, Jill, and thank you so much for sharing your pattern with us! Around here it’s almost time for a long weekend, so hope you all have a great weekend. I’ll be back to update you on our Father’s Day sock progress soon! The Boston Globe published a very interesting article thatÂ will cause knitters all over the world to smile: Purls of Wisdom. 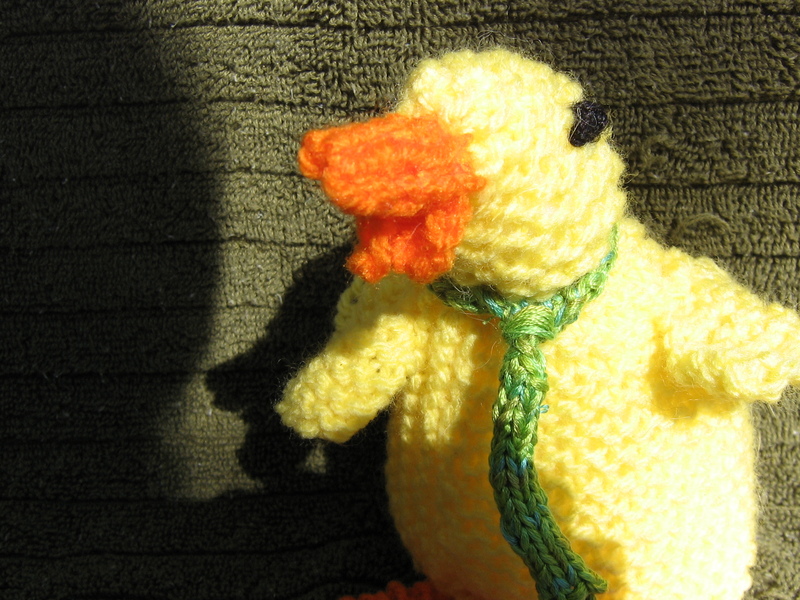 The author, Irene Sege, explainsÂ how she took up knitting for the good of her brain. 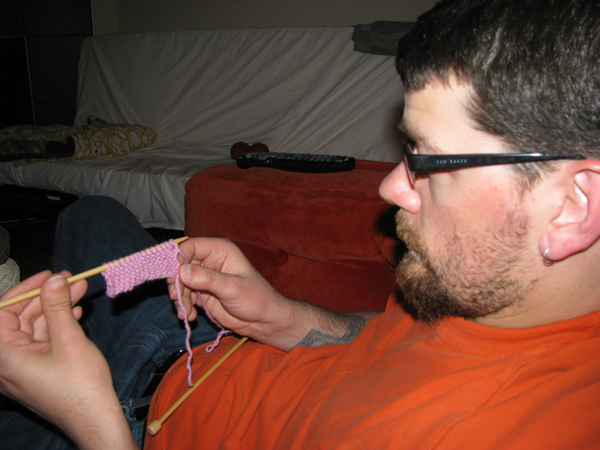 It’s one of the activities recommended by doctors toÂ potentially help keep your brain healthy, activeÂ and sharp in the prevention of Alzheimer’s Disease.Â Knitting, as Irene’s doctor pointed out, could “open new neural pathways that Sudoku and crossword puzzles couldn’t” and the article delves into the ways that knitting helpsÂ to strengthen yourÂ focus and concentration skills. As one commenter on the article pointed out, learning *new* things and using *new* skills is what counts to open new pathways in your brain to keepÂ it healthy, though I truly feel knitting still fits the bill as you learn and growÂ with it because there is SO much to learn in the realm of knitting and other fiber arts. IÂ know it will be a very long time before I learn everything there is to know about knittingÂ andÂ it will take years to learnÂ all the techniques. Each new technique and skill that I learn over time is a chance to open those pathways. And as I work to design my own patterns down the road, I am creating more growth, too. It’s a really great read! 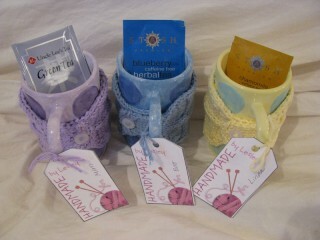 My focus this past week was on my feverish attempts to finish some Mother’s Day gifts in time to ship them out ASAP. As I mentioned in a previous post, Lucas and I spent a Saturday morning over at a do-it-yourself ceramic painting studio, where we painted three mugs: one for my mom in purple, one for Lucas’ mom in blue, and one for Lucas’ step mom in yellow and blue. Our moms will get quite the treat when the mugs arrive in the mail: each mug will contain a packet of tea (and coincidentally the teas we choseÂ areÂ packaged in wrapping thatÂ matches the color of the mug) and each mug will be hugged by a handknit coffee mug wrap by yours truly. It’s the same Coffee Mug Wrap pattern by DaniDo Crafty that I made recently for Lucas and I, only these have been made in (surprise!) coordinating colors to match the recipient’s mug, of course. Each have a little handmade tag attached to the handle (made from graphics I created myself in Photoshop) to let our moms know that we painted the mugs and knit theÂ cozies for themÂ to wish them aÂ Happy Mother’sÂ Day. I think theÂ gifts will beÂ well received :) They shipped out Tuesday, which was later than I wanted to get them out, so hopefully they’ll arrive soon. We really had a fun time at the ceramic studio, even Lucas really loved the whole process and wanted to paint everything in sight. We saw lots of other people in the studio painting things for their moms and there were a lot of really neat painting techniques that we would’ve never thought of that produced some amazing results with the paint. One such technique was blowing bubbles! One person blew bubbles that were in a paint and bubble solution in a shallow bowl and the other person placed the ceramic piece against the bubbles as they were being blown, and when they popped they left a really neat painted effect on the side. Definitely something we want to try when we go back for other things. 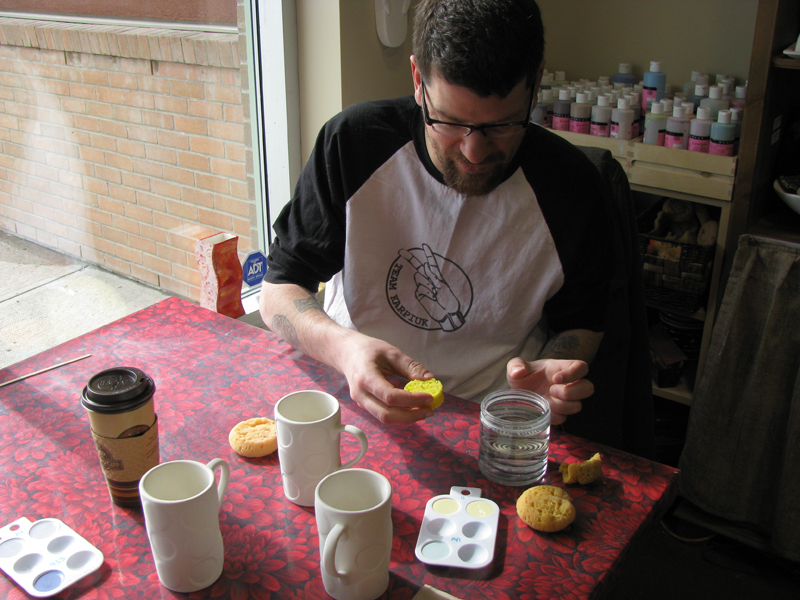 You can see all of the pictures we took of our fun afternoon at UB the Artist in Mackenzie Towne in our gallery. There you can also see more photos of the final mug sets all prettied up before they were shipped off earlier this week. I recently realized that two of my co-workers knit, and so our conversations once weÂ became aware ofÂ our kindred hobby have been most exciting.Â I was working this past week onÂ Daniella’s fabulous patterns for a Star Stitch Headband during one of my breaks at work, whichÂ brought us together.Â The headband turned out gorgeous, by the way! So gorgeous that I cast on another one last week for a friend’s upcoming birthday. One co-workerÂ who really admired the star stitch has now encouraged me to try Fair Isle/stranding and cables — she swears each are much easier than I think! I’ve been itching to give both a try, but with Father’s Day (and Lucas and I’s wedding anniversary) gifts looming on the horizon with very real deadlines and knowing it may take us forever to complete our sock project, I may just hold off until they are finished. But you know how I am; the craft ADD will take over and I’ll find myself having to try just a little during a (hopefully) quick detour of finishing those projects. I haven’t even had time to play with my new drop spindle and roving kit yet! I’m sure I can sneak in a few minutes sometime soon ;) Hope you had a Happy Mother’s Day! 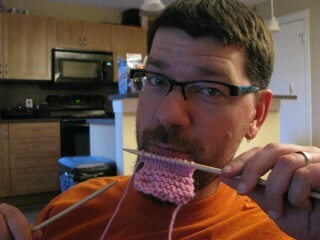 My handsome husband's first knitted swatch. Notice it contains garter AND stockinette stitching! With Mother’s Day gifts finished up and shipped off earlier this week, I’m already thinking ahead to Father’s Day.Â I’d been thinking that I’d love to knit up some socks for our dads this year, but I’m not the fastest knitter in the world so I’m not sure I can manage it in time.Â I mentioned this time concern to Lucas on Thursday afternoon, who then suggested I teach him to knit so that he can help by knitting his dad’s socks while I knit my dad’s socks, and together we’d create knitted socks for our dads for Father’s Day. Not only does he want to spend the evening snuggled with me and my KP needles, he knew all of the basic terminology for the techniques he needs to know and wants to learn them! Dare I say my husband may turn into a knitter? My mind fast forwards to him having his own Ravelry account and uploading FO pictures and asking me what kind of yarn he should use for his next project. And shopping the LYS together. And how many more things we can knit for our future kiddos if there’s two of us knitting for them! When I came out of my daydreaming haze and picked up my jaw from the floor, I realized he was serious. Thursday evening I taught him the basics of knit and purl and he’s been doing really well!Â We practiced again last night and I really think we’ll be able to attempt Father’s Day socks for our dads Magic Loop style. It’ll be a learning experience for both of us since I’ve only done socks with DPNs and only played with ML for the ribbed cuff of a sock before, but it can’t be that hard once I get to the heel, right? Wish us luck! I don’t know about you, but I’m still in shock. This is one giveaway you won’t want to miss… over at the Things Moms Like blog they are giving away an entire KnitPicks Harmony (wood) interchangeable knitting needle set! And not only that, but four balls of the fabulous KnitPicks (organic!) 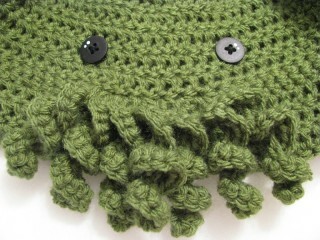 Simply Cotton worsted weight yarn, too! You’ll get to try four different colors: Marshmallow, Malted Milk, Ginger and Toffee — a $90 value that cannot be beat. 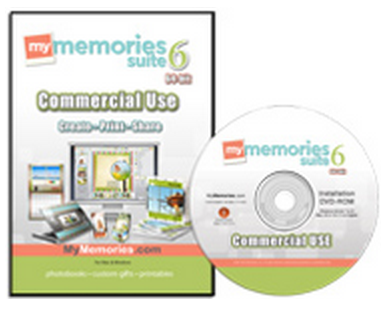 Get on over there and enter to win! Speaking of KnitPicks, my order finally arrived today!! The squeals that came out of me when I realized it had come were not human. I am too excited — I can’t wait to go and play! 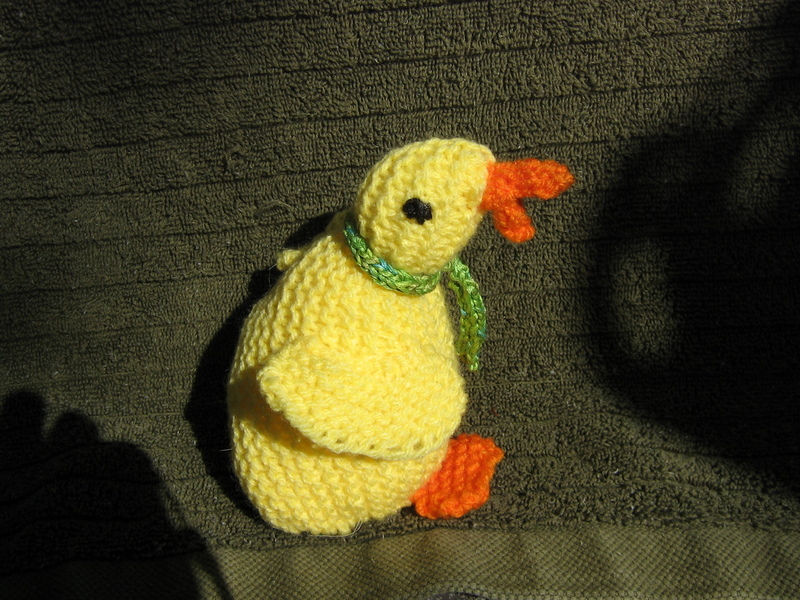 And get this… Lucas asked me to teach him to knit today. But shhhh… don’t tell anyone. He’s going to learn so he can help work on Father’s Day presents :) Wish him luck! Drop Spindle set by Maine Woods Yarn & Fiber! No, my KnitPicks nickel-plated interchangeables haven’t arrived yet (trust me, I stalk the tracking number 800 times a day) BUT more goodies arrived today; my first wool rovingÂ and drop spindle kit!Â The kit comes from Maine Woods YarnÂ & Fiber, and I highly recommend ordering from them if you plan to learn spinning or if you need gorgeous (gorgeous handpainted!) roving to spin with. You can order from their website or check them out on eBay, where I originally found them. The customer service is absolutely fantastic and it was a pleasure working with the owner, Arlyne. 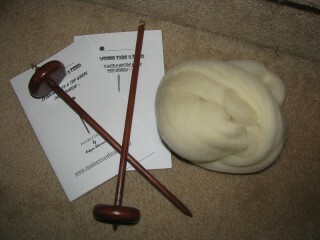 I will definitely be ordering from them again — especially because I can’t help but drool over their yarn swift.Â I ended up with a maple wood top whorl and bottom whorl drop spindle and have been scouring YouTube for good instructional videos to accompany the great booklets that came with the kit. (I’m a visual learner. )Â I think I’m going to work with the top whorl first, because this video byÂ theartofmegan is very clear and easy to understand. With written instructions from Arlyne and the video to guide me, I think I can handle it! Once I spin some yarn I plan to give dyeing a try — this will be a very noobish, first time experience for me on many levels. I’m so excited! Not that I don’t have 100 other things I need to finish, like starting Father’s Day gifts, working on birthday presents for a couple friends and a wedding anniversary present for Lucas, allÂ within the next two months or less. Ahhh! But how can I say no to getting started with these wonderful goodies sitting here in front of me, practically calling my name? What would YOU do?